After dragging ourselves away from the excitement of carpet shopping, we took the kids to Brigsteer Woods. A walk in the woods is always a big hit with them – almost immediately they found a fallen tree trunk laying over a dip which provided an opportunity for feats of daring, balance and agility. The strange little woven-stick buildings I walked past on my last visit were also popular. 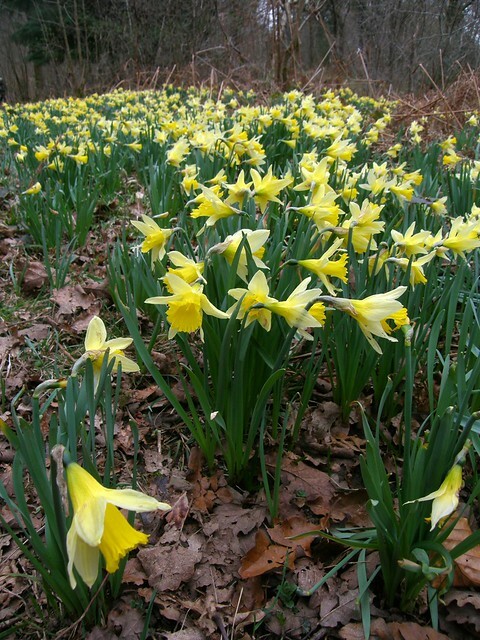 From an adult perspective though, the most striking thing was the ubiquity of great drifts of daffodils. 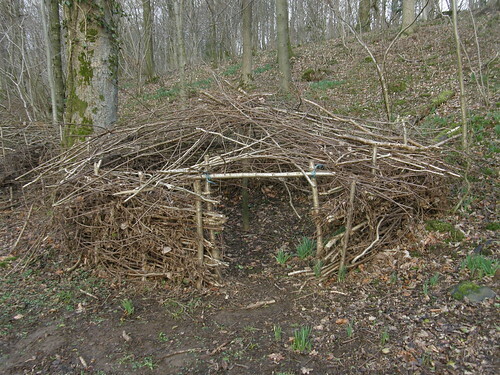 Apparently, once upon a time this was a common sight all across Britain, and the reasons that such displays are much less common now are not fully understood. 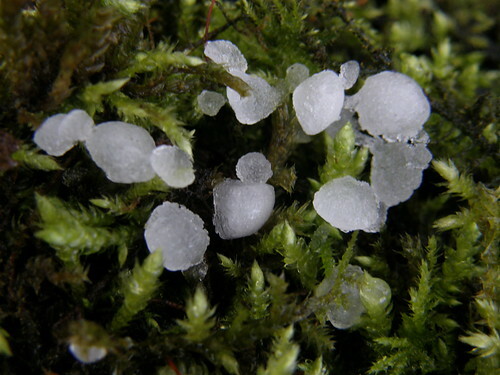 …which have hair-like teeth. 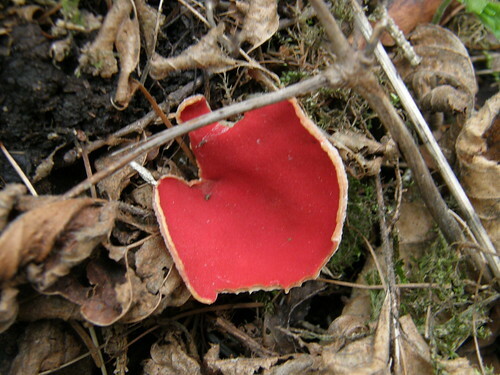 The spur was darker than the petals. 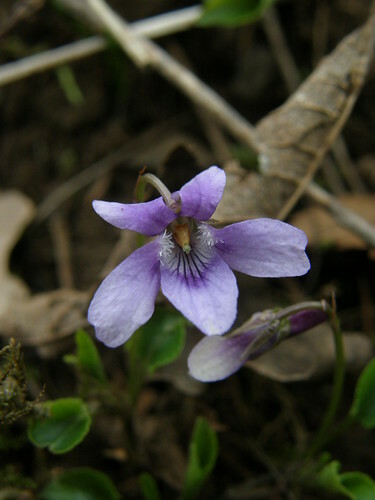 I think that this is early dog violet. 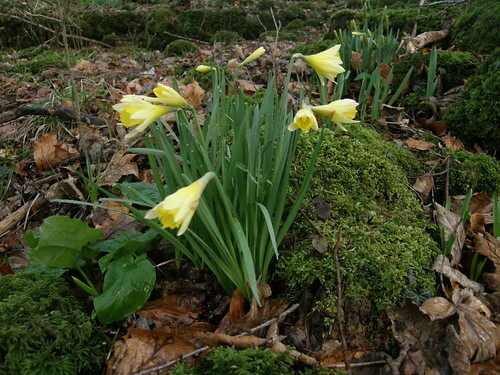 Although daffodils provide the principle entertainment at the moment, it was clear that there will be a succession. 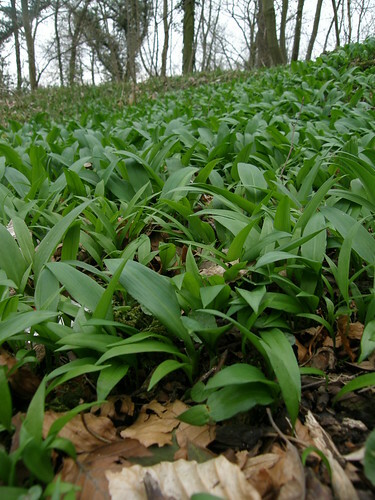 Some area were completely colonised by ramsons…. 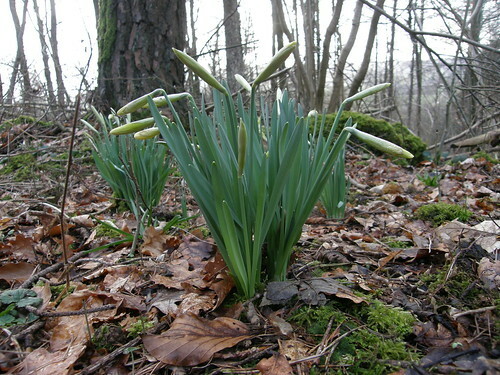 And it looked to me as though there will be a good display of bluebells too. 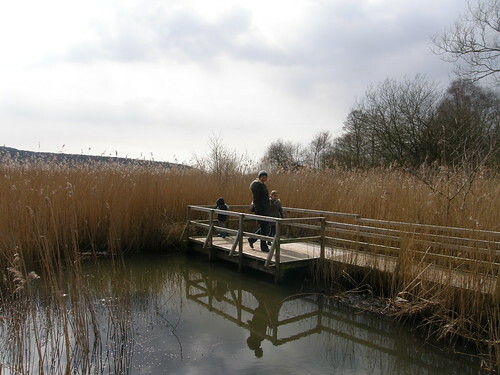 We even found a solitary scout leading the way…. 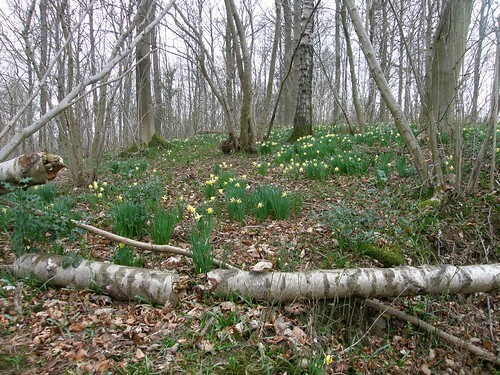 There were wood anemones and primroses too. 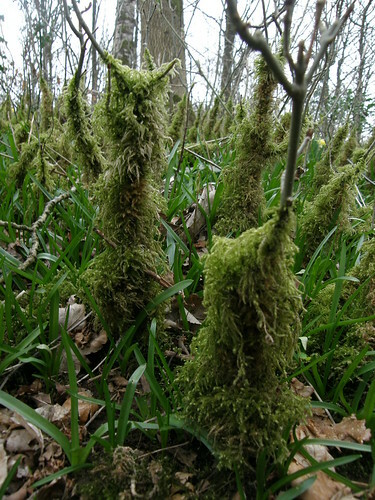 Everything was moss-covered, even the smallest saplings were wearing shaggy socks…. Down by the path we also had a ‘Lord of the Flies’ moment when we found a skull mounted on the branch of a small tree…. 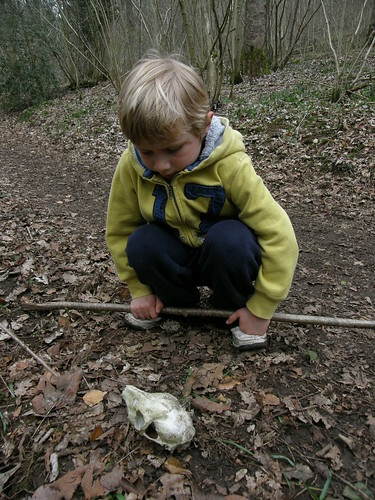 …and has brought the skull home with him to add to his bone collection. 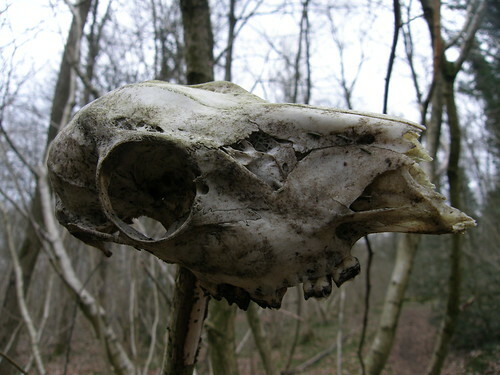 Judging by the size and the teeth, which all looked like molars, I’m guessing that this is a sheep skull, although I suppose that it could be a roe deer. Around this time last year, we had a cracking walk with friends, one of the highlights of which was a mass of frogs in the pond-dipping area at Leighton Moss. On our way out to look at carpets on Saturday we stopped briefly at Leighton Moss to see whether a similar display might be on offer this year. 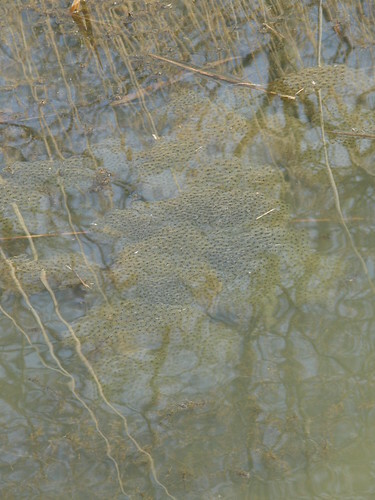 There was lots of frogspawn…. 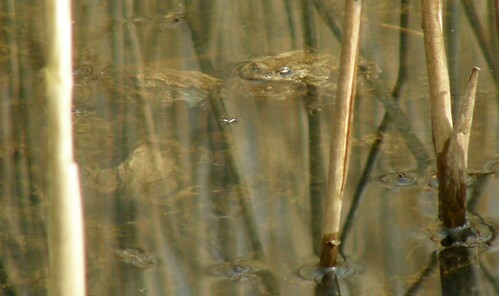 …but at first we could see no other amphibian activity. In fact, we were about to head back to the car when a movement caught my eye and I spotted at first one frog, then three of four and eventually I think about thirty. They were across the far side of the pool and so not as easy to photograph as last year. 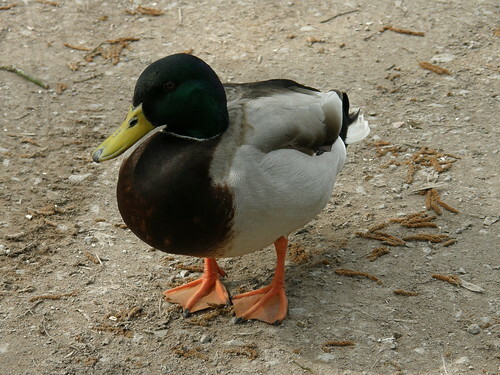 So, we didn’t get so close to the toads (or frogs) but we did have a friendly chat with some very tame mallards in the car park. 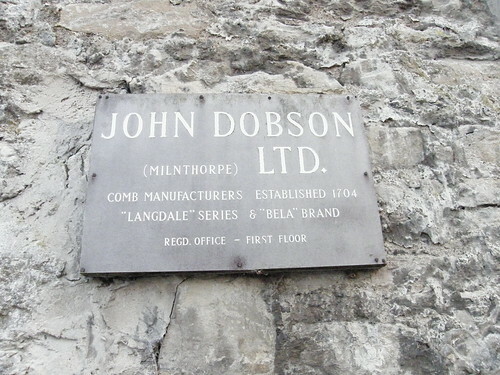 John Dobson Ltd. still seem to be a going concern. 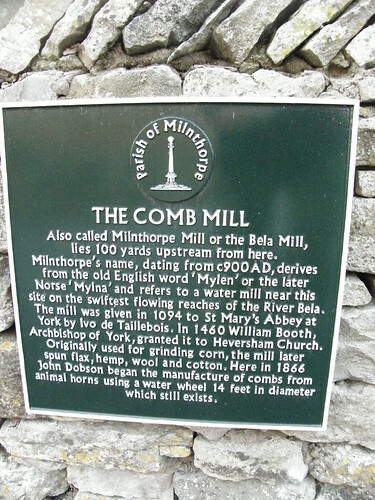 John Dobson (Milnthorpe) Ltd. are the largest producer of hair combs (in volume terms) in the U.K. Comforting to know that somebody still makes combs (or indeed anything) in the UK. 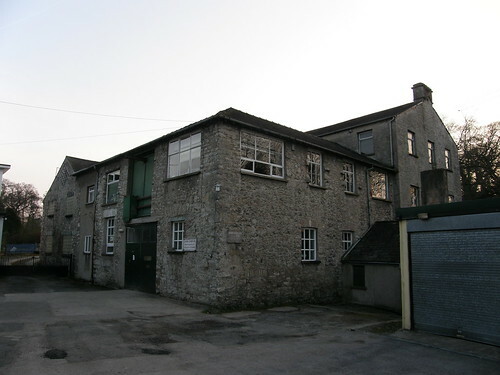 If they began to make combs here in 1866, but were established in 1704, where were they based in the interim? 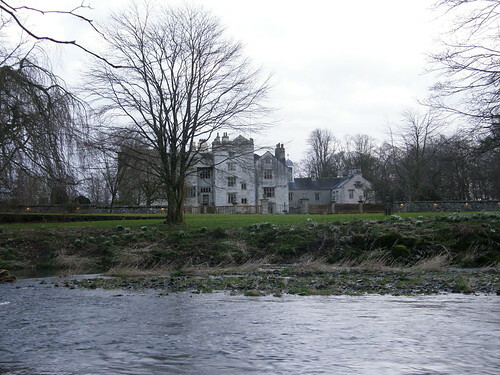 Langdale? 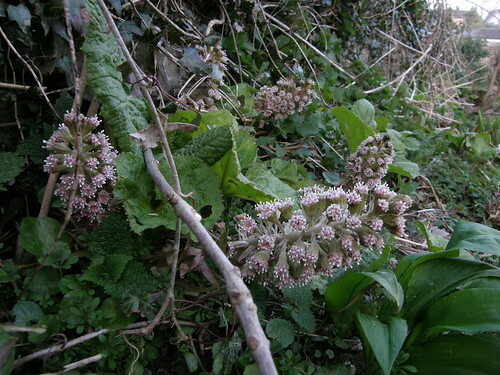 On the bank of the Bela, I found another early spring flower: butterbur. We saw them in Aldingham too, a few weeks back, but the photos didn’t turn out too well. In the midst of a week of glorious weather, frustratingly spent, much of it, stuck indoors at work, a small window presented itself, an opportunity for a short local walk. 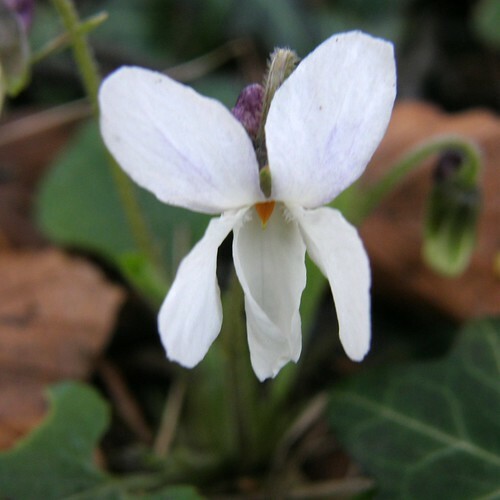 Heading up towards Eaves Wood I was pleased to see white violets flowering. 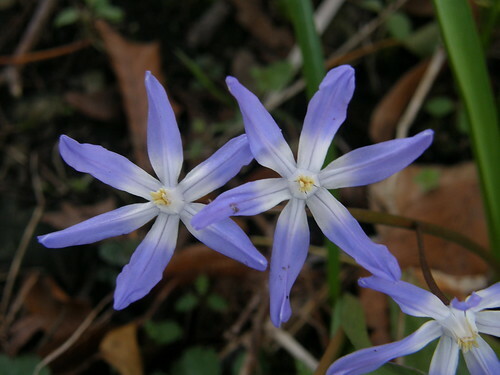 And nearby, large and cheerful clumps of these scilla. 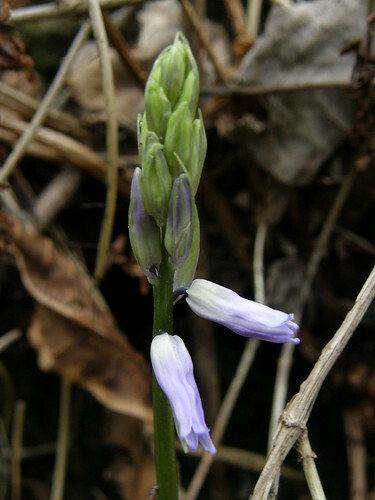 I only know that these are scilla after a helpful comment in reply to a previous post back in the early days of this blog. After another post with not one but several appeals for assistance in identifying plants, Sheila recommended ‘The Wild Flower Key’ which I eventually got around to adding to my growing natural history library. Now that the wild flower season is getting into full swing I’m keen to put my new book to the test. 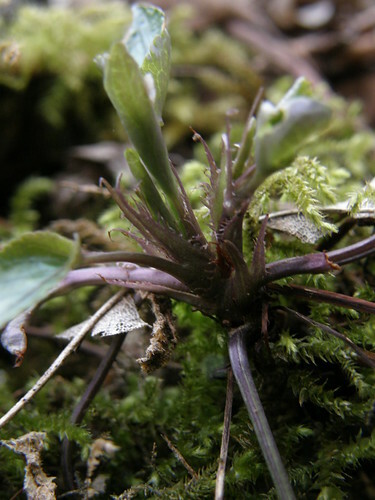 I knew that there are several different violets – would the keys enable me to distinguish between them? 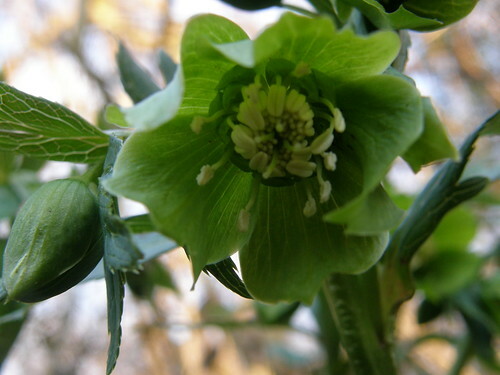 In fact, I’m not sure about any of the first three points – but it seems to me that the sepals are blunt. What’s more – the book has helpful diagrams and more information. 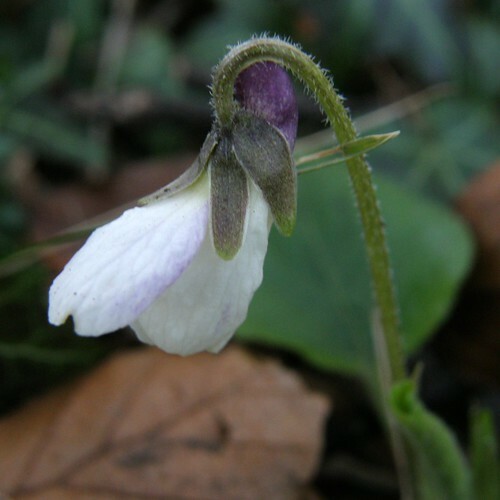 So – the flowers are white which narrows the options, the flower stalks are leafless……..I think that these are sweet violets, our only scented variety. Did they smell sweet – hmm…….didn’t think to check that! Something to remember for next time. 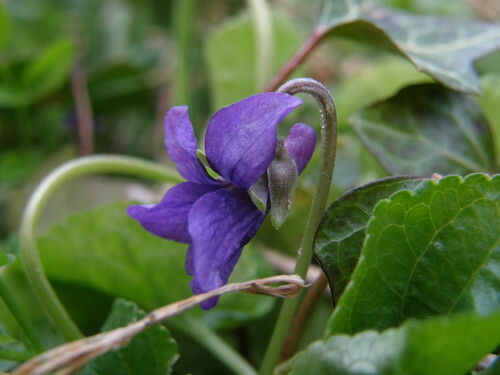 One note of caution however – apparently violets are prone to hybridisation and identification can therefore be difficult. Oh. Still – I think I shall enjoy this kind of detective work. I’ve been savouring a book of short essays about nature and life in the country during World War II, ‘Highland Pack’ by Neil Gunn. Sometimes I am astonished at the amount of pleasure or delight which in a forgetful mood one passes by on the other side. One can cultivate surprise, just as one can cultivate onions. Let there be nothing mysterious about this. Every sense can be trained. Appreciation can be deepened. The first magical surprise at sight of a lovely thing need not be the last nor the profoundest. 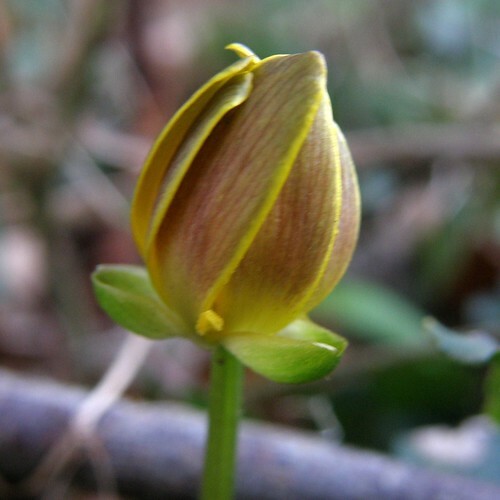 …lesser celandine. There’s a patch of earth beneath some trees on the street near work which is completely covered with them, and this week when I passed them they were all stretching wide open, every flower stem perfectly upright, straining sunwards like eager nestlings striving for a tasty worm. 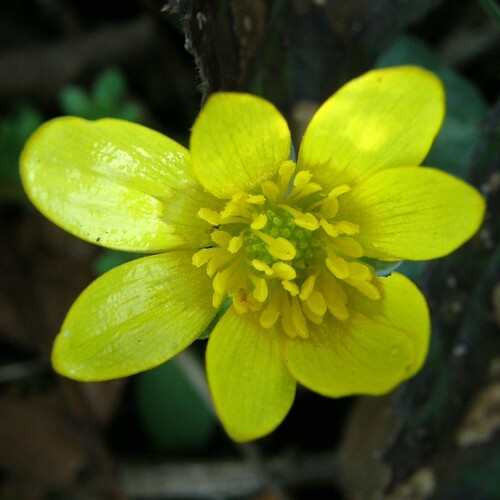 Celandines close when they are not in the sun (why? 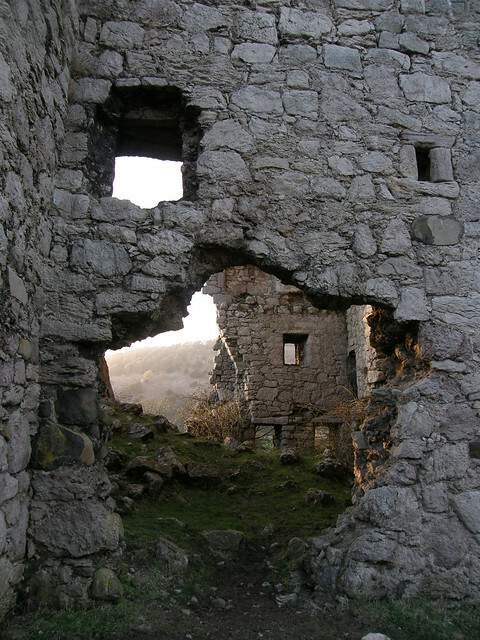 ), and along my route, mostly in shade, they were mostly closed. 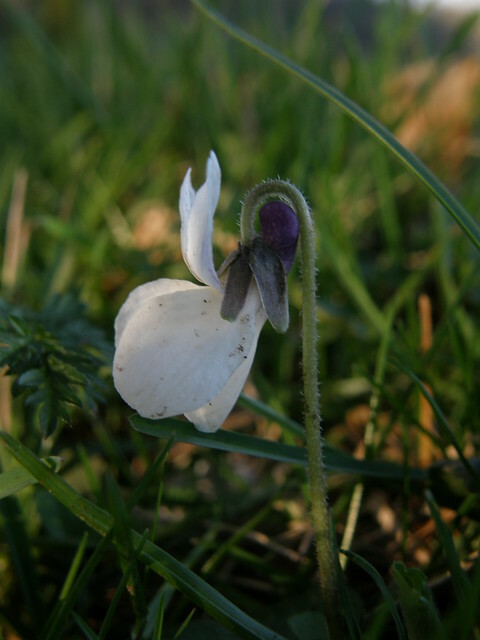 A little further up the hill there are more violets, not white but still relatively pale. 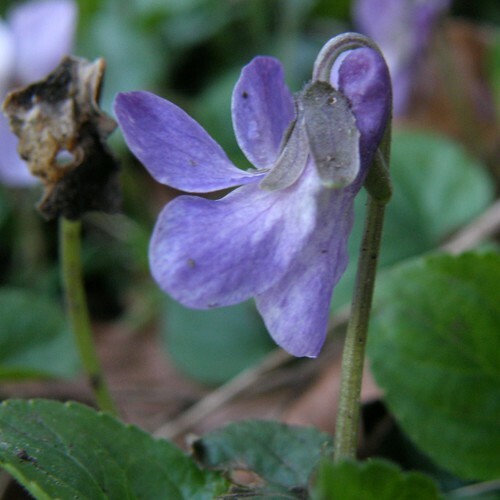 The strong purple veins or nectar-guides which many violets have are absent. 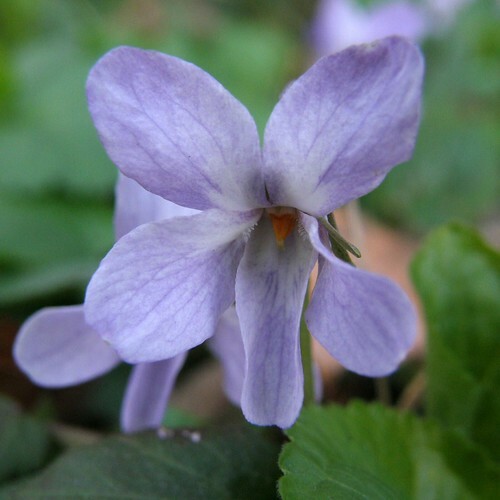 More sweet violets? Sometimes I may have to take the book out with me. In the woods, both on the National Trust property and also over on the north side of the woods, a great deal of coppicing has been carried out and I think that this might at least in part in order to encourage the violets – violets are an important food-source for fritillary butterflies which can be found in this area. 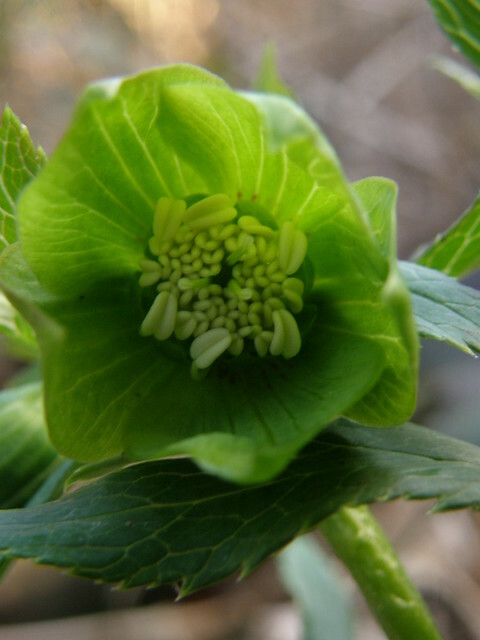 I took a tour around Eaves Wood, looking for a green flower that I thought I remembered finding here at this time of year before. But perhaps not this early, because I didn’t find it today. This is, in part, the reason for the Blog because hopefully next year I will have a record of when and where to look through the course of the year. I turned right instead, taking a more direct route which skirts Holgates Caravan Park. 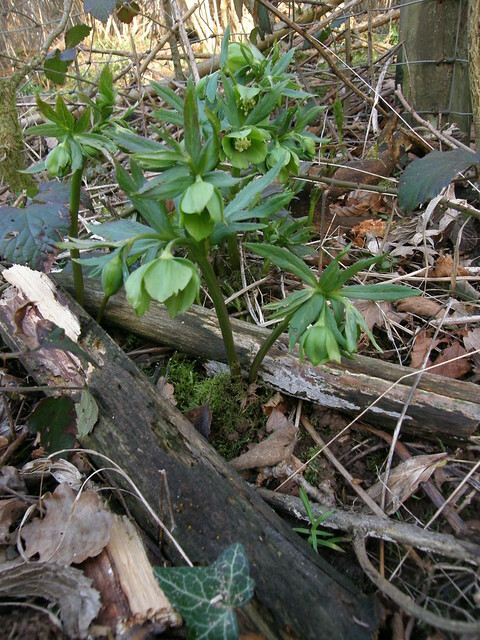 I kept scanning the bases of the hedgerows on either side of the track hoping that the hellebore might grow here too…and lo and behold…. In fact in the end I saw quite a lot of plants, some of them still catching the sun, but frustratingly on the wrong side of a barbed wire fence for me to get sufficiently close to take good macro photographs. Next time ,hopefully I will see them in sunnier circumstances and get some sharper close-ups. 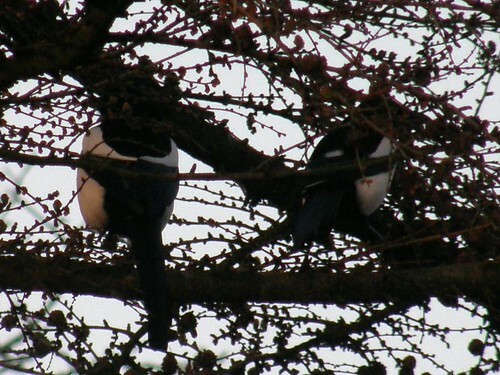 Another area in which I am hoping to fail better is in catching some photos of magpies whilst I’m out and about. 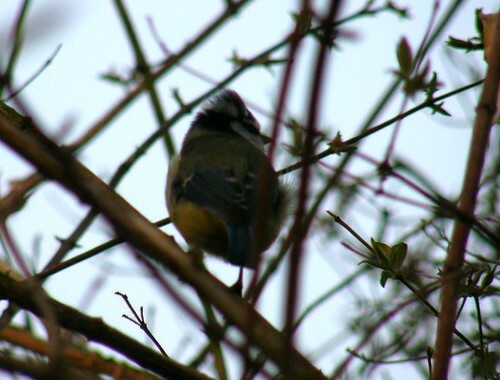 They are very common birds in our vicinity, but most elusive when a camera is pointed in their direction. Not Snowdon, Scafell and Ben Nevis – a bit more local than that. 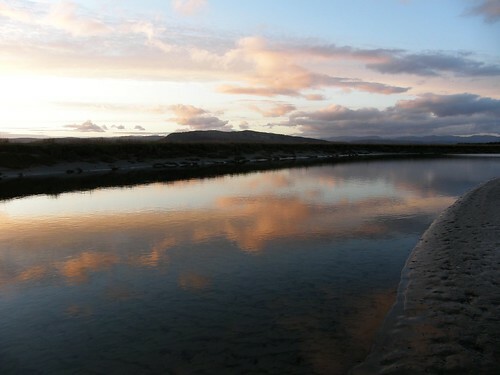 Not Pen-y-ghent, Ingleborough and Whernside either, although they are reasonably local. In fact, much much closer to home than that. 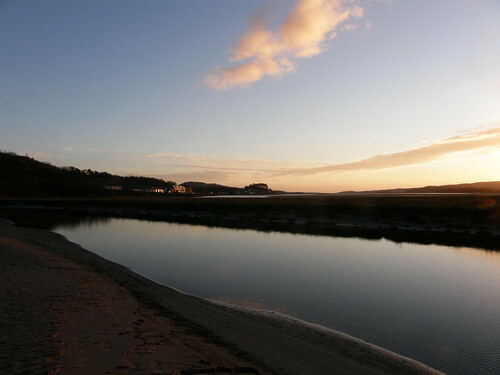 This was our three peaks – Castlebarrow, Arnside Knot and Warton Crag. The local Scout troop (is that the correct collective noun for Scouts?) were taking it on, and we decided to follow suit. We couldn’t start with the Scouts, because R, the local Tower Captain, had some serious bell-ringing to do before we could begin, but we followed in their wake. 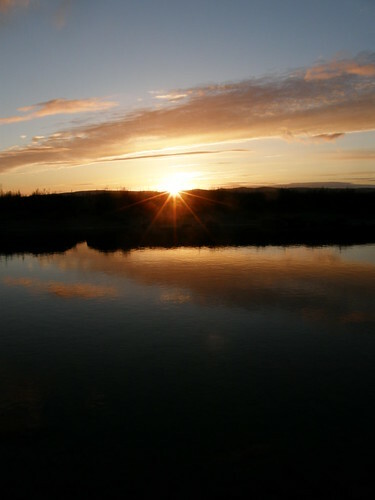 Friday had been a glorious day, cloudless and bright. Saturday was almost as fine. 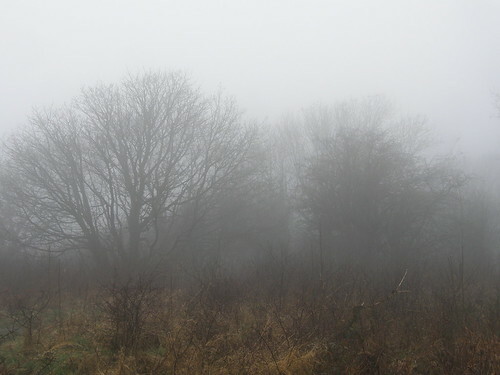 Naturally, Sunday, the day we had chosen for our walk, was dreich. 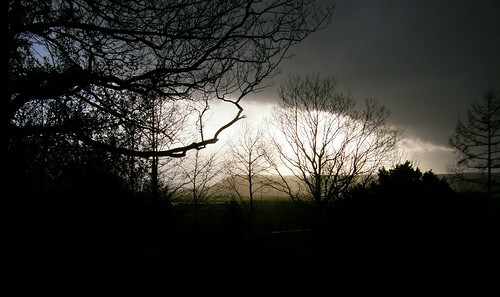 A combination of dull, overcast, drizzly, cold, misty and miserable weather. At least 4 of the above adjectives must apply before the weather is truly dreich. All of the adjectives applied in full effect. 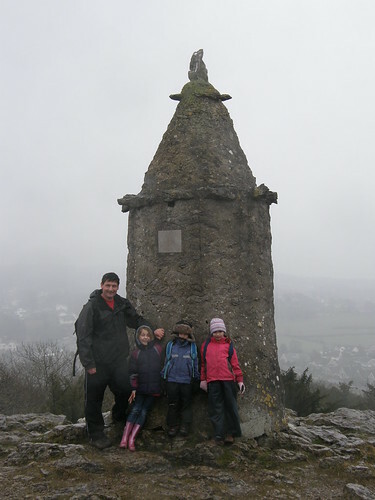 The kids were not deterred however and we made it to the Pepper Pot (on Castlebarrow) in good spirits. 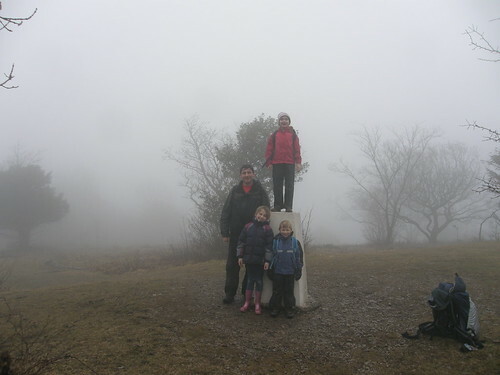 We were still smiling when we found the trig pillar on Arnside Knot – in the cloud at 159m above sea level – how’s that for dreich? But as we left the top, B’s little hand crept into mine and he intimated that he might be satisfied with two peaks. We had to pass back through Silverdale anyway so it was easy to arrange a rendezvous with TBH. Poor A now found herself caught in the horns of a dilemma – she really wanted to continue – I think that she fancied the bragging rights at school on Monday morning, but she began to worry that the walk might be too far for her or that she might get cold and tired like her brother. Eventually she chose discretion and TBH took all of the kids leaving only R and myself to continue on to Warton Crag. On the way we had to steel ourselves to resist the temptations of the Silverdale Hotel (know locally as ‘The Lower House’) and of generous invites to join some friends we bumped into for lunch at the Wolf House gallery. 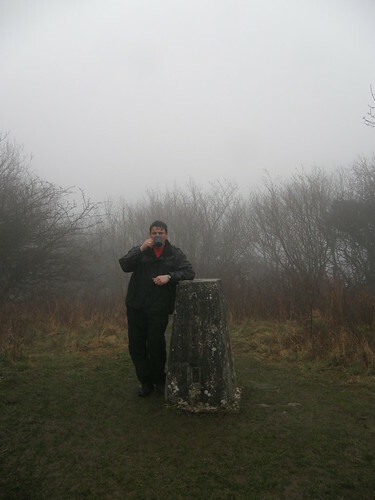 If we’d once got warm and dry so close to home we might never have continued to our soggy lunch stop on Warton Crag…. 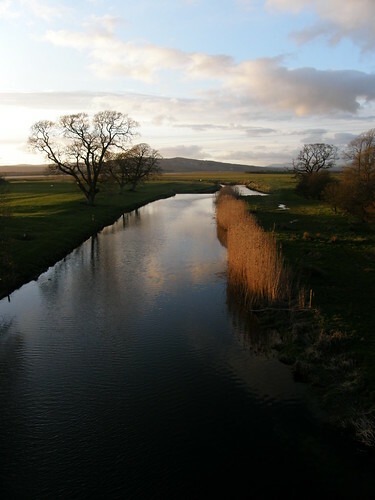 …and the excellent views from there…. None the less, I enjoyed getting out. This would be a very fine walk on a better day. It may be just a little easier than the other Three Peaks walks. My pedometer gives the distance as 18.84km which probably isn’t too far off and I suppose that there might be about 400m of up and down, or there abouts. 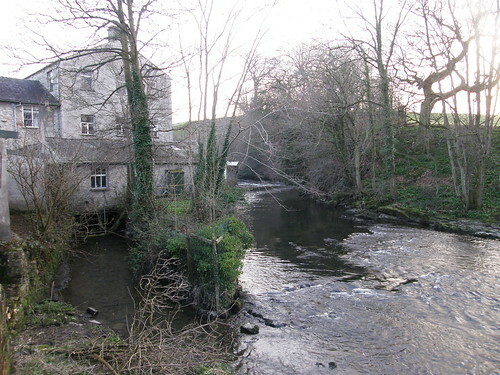 Over the course of several months I have noticed that Thursday lunch times have been consistently bright and sunny – and I’ve bored numerous taxi drivers with that observation as they have ferried me to Carnforth. This Thursday it was overcast rather disappointingly. But by the time I was operating Dad’s taxi service in the evening it had brightened up. 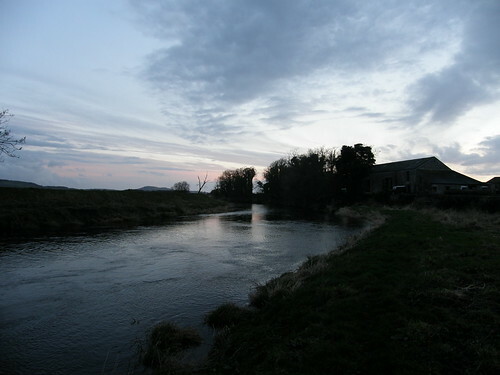 Stuck in Milnthorpe with a little time to kill I opted for a short stroll by the Bela. Every time I visit this spot I hear splashes and see ripples spreading across the surface and think that I might spot fish in the shallow water, and indeed I have seen fish here, but I noticed on this occasion that at least some of the splashes were caused not by fish but by large bubbles of gas (presumably methane?) escaping from the mud on the river bed.